Some of the tours we offer could just about lay themselves out, without our help: there may be only one realistic route choice in an entire region. That is not the case in the three counties north of the Golden Gate (Marin, Sonoma, and Napa). There is such a dense tracery of tiny back roads and lightly-traveled highways throughout this region that settling on a single, one-size-fits-all route is impossible. Thus, you see the wide range of options reflected at the top: from six to nine days of riding, and anywhere from an easy 300 miles to a very tough tour of 550 miles (very few of them flat). Even with all those options, there are still so many great roads left out of this tour that we have created two Mini-Tours for the area that will make use of many of those fine roads. Because of the varied topography and the constantly changing (and almost always beautiful) scenery, this region may rank as the most popular cycling destination in the state…perhaps in the country. Pro teams sometimes do their off-season training here, citing the “almost European” riding conditions. Nearly every cycle-tour operator in existence offers a “Wine Country” package, and our route will travel roads used by these catered groups and by at least a dozen organized centuries, doubles, and other mass rides. But we’ll also explore some obscure roads that rarely show up on the routes of the mainstream tours. This is a tour that could be made to work with overnights in lodgings (rather than camping). It would involve minor tweaking of the existing routes, but it can be done. This stage is only nominally “optional” because, being a loop, one needn’t ride it to get from point A to point B along the tour route. But I consider it an essential part of the tour. Staging out of the starting campground north of Petaluma, it explores dozens of little back roads in the hills of southwestern Sonoma County and northwestern Marin County..some of the prettiest and emptiest roads around, perfect for cycling. There are “off-ramp” style motels not far from the campground and more, varied inns and hotels in central Petaluma. This is a fantastic bike ride…a classic. Works its way west from Petaluma through the coastal hills and then doubles back inland through San Geronimo Valley before climbing from Fairfax up and over the ridge and descending to Bolinas on the coast. Then it follows Hwy 1—and the San Andreas Fault—north from the Bolinas Lagoon to a pleasant camp in Olema. 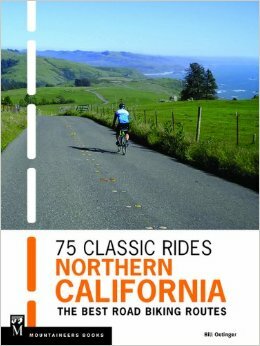 But the real centerpiece of the stage is the optional out-&-back to the summit of Mt Tamalpais, one of the greatest stretches of cycling and sight-seeing anywhere. A second optional loop explores the quaint town of Bolinas. Showers at camp. Good lodgings are almost immediately adjacent to the camp. Tours the Point Reyes National Seashore, one of the most beautiful, unspoiled landscapes in the state. The basic route rolls all the way out to the end of the continent, to the Point Reyes Light Station, a hilly and often very windblown adventure. The bonus leg travels to the northern end of the park to visit historic Pierce Ranch, a beautifully preserved 19th century farm compound. Access to great hikes in the National Seashore as well, or rent a kayak for a paddle on the bay. Return to same campground (or hotel) in Olema. Runs north through the quiet country town of Point Reyes Station and on up alongside beautiful Tomales Bay to the sleepy village of Tomales. After wandering around on some of the prettiest little country roads you could ever wish for, it returns to the ocean for a dance along the rugged cliffs of the Sonoma coast before turning inland to a private camp in a bend of the Russian River. The longer, hillier route climbs (steeply) onto the high ridge line above the ocean before whistling back down to camp on a series of snappy little descents. Superb cycling every mile of the way. Showers at camp. There is only one B&B near Duncans Mills (as far as I know), but there are other inns in the surrounding towns and countryside. King Ridge is considered one of the most spectacular, legendary cycling roads in the country, and the other roads that make up the balance of this loop are not bad either. After an almost level run alongside Austin Creek, the King tilts up into the rugged hills in a series of steep, wicked climbs that deliver you to cycling heaven: miles and miles of empty country, running along ridge lines high above deep canyons or plunging seaside cliffs. This is an essential stage for strong riders, one of the best rides ever. For less ambitious riders, we suggest ways to shorten and soften the ride. Returns to the same campground in Duncans Mills, so those not wishing to tackle this challenging circuit can spend the day relaxing on the bank of the river. Finally…you get to the vineyards and wineries that give the tour its name. But first, you visit groves of old-growth redwoods along the Russian River, and on the long route, climb into the apple orchard country around Sebastopol and Graton. Eventually you roll out into the mellow hills and valleys of a succession of premier wine regions: Russian River Valley, Dry Creek Valley, and Alexander Valley. Overnight in a private camp overlooking Alexander Valley. Showers. There are good lodgings in Cloverdale. The short route rolls easily through the vineyards of Alexander Valley while the long route climbs into the remote back country known as the Geysers…a raw, rugged region of intense geothermal activity. Beautiful scenery, big climbs, and the longest, fastest downhills of the tour are in store for those who take this walk on the wild side. After the two routes rejoin, the stage continues south through Alexander Valley and into quiet, scenic Knights Valley before spilling out into famous Napa Valley. Camp south of Calistoga in a lovely state park. Showers. 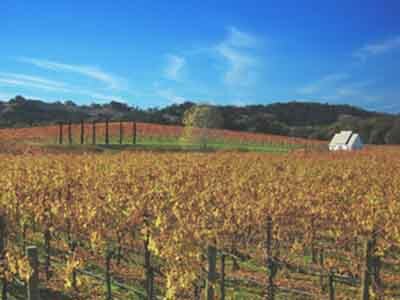 Many fine inns and hotels in Calistoga, a full-service resort. A relatively easy and very pretty ride. The short route—included only as a bail-out for tired riders—stays on the nearly level floor of Napa Valley. The longer route climbs out of the valley and descends into delightful, secluded Pope Valley…a cycling dream world. Eventually the route returns to Napa Valley and continues south—past one prestigious winery after another—to a pleasant park on the outskirts of the city of Napa. Showers. Plenty of lodgings in nearby Napa. The shorter route is actually the harder of the two today. The flatter route winds south and west out of Napa through the low, rolling hills of the Carneros wine region before visiting the historic Spanish colonial town of Sonoma. The hillier route grapples its way over a couple of very steep mountains, with each killer climb followed by a rocket descent. The routes reunite in Glen Ellen—Jack London’s home town—and then everyone climbs one last steep hill before descending back toward Petaluma and the campground where the tour began so many days ago.